A Little Bit of Soy – Page 14 – This is my cooking and recipe blog including both Traditional Japanese Recipes and my own creations inspired by Japanese Food. Hope you enjoy! 1. Preparation of Dried Shiitake Mushrooms. Rinse Shiitake to remove dirt. Soak them in warm water for about 10 minutes or until they become soft. Do not soak them too long to avoid the taste of mushrooms to run down to the water. Save the soaking liquid. 2. Lightly squeeze Shiitake. Remove the stems and slice them into 0.5 cm width. 3. 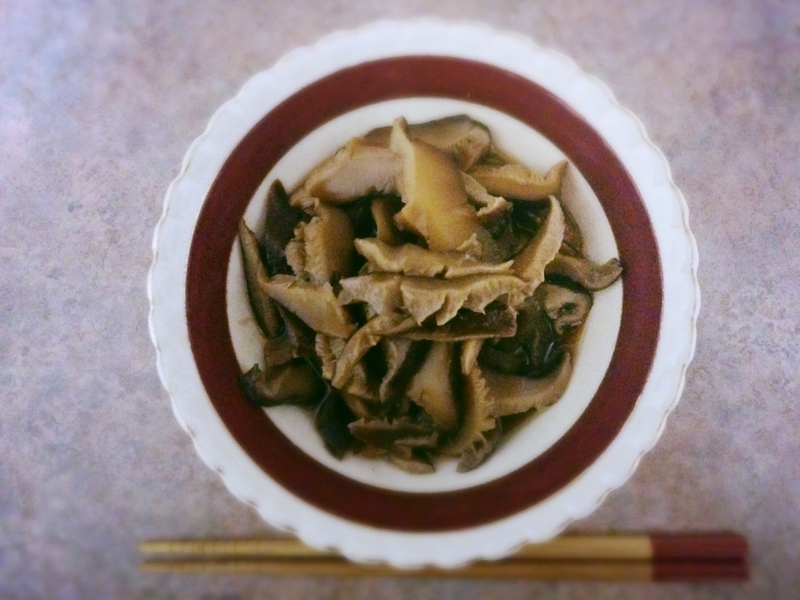 Place the sliced Shiitake into a small pan. Add the soaking liquid and bring it to boil. 4. Once it is boiled, reduce the heat to low-medium. Add Dashi Powder, Sugar and Mirin. 5. Put a Otoshi-buta on and simmer it for 30 minutes. 6. Add Soy Sauce and simmer for 5-10 minutes. 7. Turn the heat off. Put a lid on and cool it down. 2. 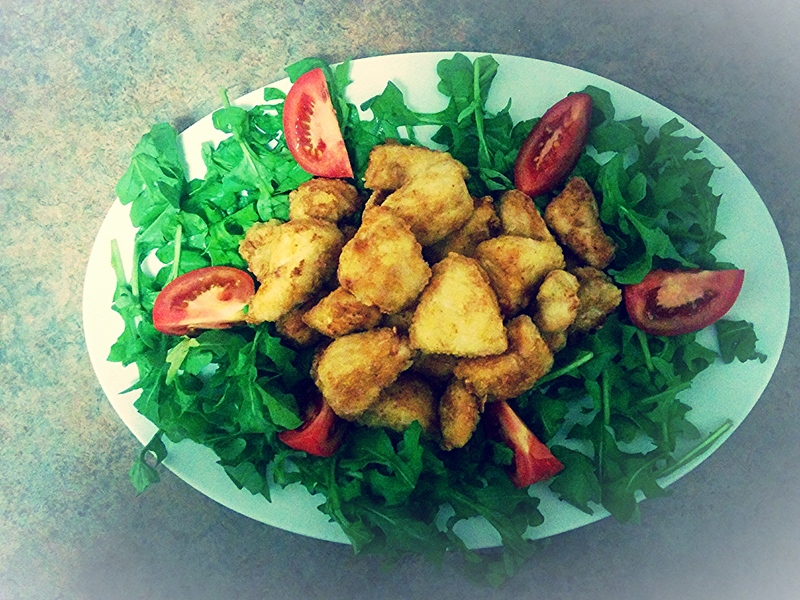 Place the Chicken into a bowl. Add Oyster Sauce, Soy Sauce and Garlic. Combine the, well. Cover it with plastic wrap and marinade it in a fridge for at least an hour. 4. While the oil is heating, put flour in a bowl and add the Chicken. Toss and coat the Chicken with flour evenly. 5. Deep fry the Chicken. When you deep fry it, it is important to keep oil temperature as 180 degree. Do not put too many pieces of Chicken at once as oil temperature will come down rapidly, and the Chicken will get oily and not be crispy. 6. Once the Chicken is cooked and the surface is turned to light brown, transfer the Chicken onto a wire rack or kitchen paper towel to drain oil. 7. Serve Karaage while it is hot. * To check oil temperature without a thermometer, drop a piece of deep frying batter (or maybe a piece of minced Garlic In this case) in the oil. When it goes down to the middle of oil and quickly comes up, it is the right timing to put the Chicken in. 1. Firstly, cook Rice. Put Rice in the Rice Cooker’s removable bowl. Wash the Rice well. Rest the washed Rice in the bowl for about 20 minutes. Add Water slightly below the line of 2 as marked inside of the bowl. 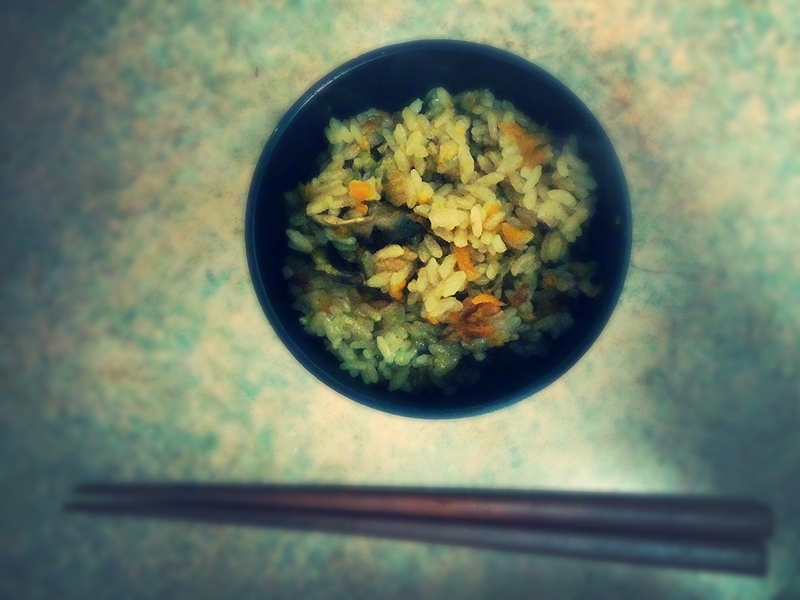 Put Kelp on top of the Rice and cook it as you cook Rice normally. After the Rice cooker completes cooking, let it sit for about 30 minutes to steam. 2. Mix Vinegar, Sugar and Salt. 3. Transfer the cooked Rice in a large bowl. Add the Vinegar mixture and mix it whilst the Rice is still hot by using a Rice Paddle. When you mix, try not to squash each grain of Rice. Mix it like you slice it by using the side me the Rice Paddle. 4. Cover it with a kitchen town and cool it down to the temperature that you can handle it easily. 5. Prepare Toppings, while the Rice Is cooling down. – Crack Eggs and mix them with Soy Sauce, Sugar and Salt. Make Scrambled Eggs. – Cut Shiitake into small pieces. – Cut Smoke Salmon into a bit-size. 6. It is ready to assemble once the Sushi Rice is cooled down. Spread the Rice on a plate. 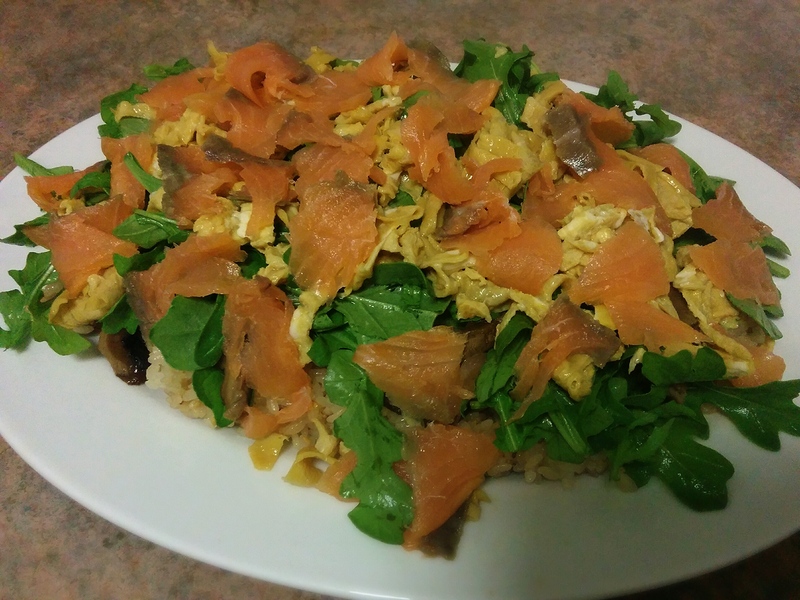 On top of the Rice, spread Shiitake first then Eggs, Rocket Leaves and Smoke Salmon nicely. 1. Put Rice in the Rice Cooker ‘s removable bowl. Wash the Rice. 3. Add Dashi Powder, Soy Sauce and Mirin into the Rice. 4. Add Water up to the line of 2 as marked inside of the bowl. Mix it gently. 5. Add Carrots, Mushrooms and Usuage on top of the Rice. 6. Set the Rice Cooker and cook it as you cook Rice normally. * It is the best to use Japanese Rice if it is available. If not, use Short Grain Rice or Sushi Rice. ** Method 2& 7 will help the Rice to get moist and lovely texture. If you have a Japanese Rice Cooker, this time might have been already included in the cooking time. Please refer to the instruction of your Rice Cooker. 1. Put the thinly sliced Cucumbers in a strainer. Sprinkle Salt over the Cucumbers and stir them. Let it sit for about 15minutes. 2. 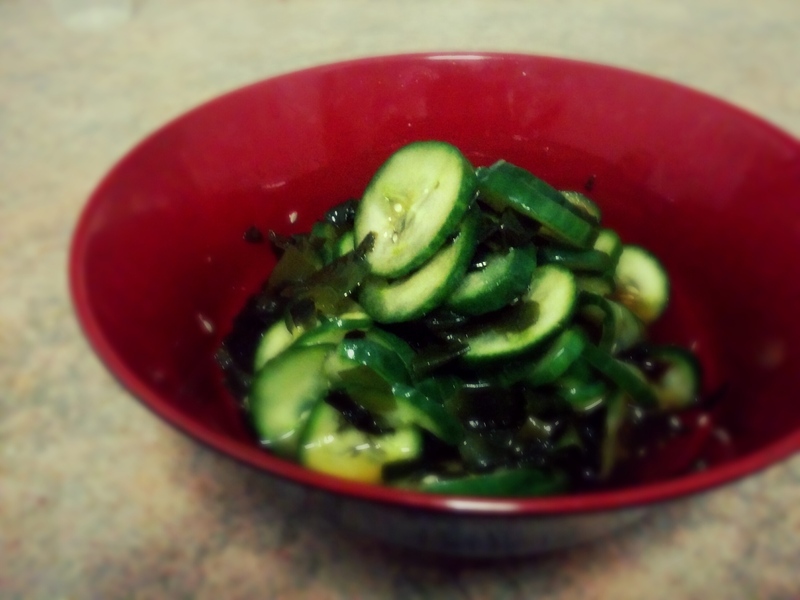 Reconstitute Dried Wakame in water. It will take about 5 minutes. 3. Mix Vinegar, Sugar and Soy Sauce in a bowl. 4. Squeeze water from Wakame and add it in the Vinegar mixture. 5. Wash the Cucumbers lightly. Squeeze water from the Cucumbers and add them in the Vinegar mixture. 6. Mix them well. Pickle them at least 30 minutes before serving. 3. Turn and cook the Salmon for about 5-8 minutes or until the Salmon is cooked. Remove it from the pan once it is cooked. We use the same frying pan to make Amazu Sauce. 4. Make Amazu Sauce. Mix Water, Dashi Powder, Soy Sauce, Mirin and Balsamic Vinegar well. 5. Heat the pan on medium with a teaspoon of oil. 6. Add Onions, Capsicums and the white part of Spring Onions into the pan. Cook until the Onions become clear. 7. Add the green part of Spring Onions into the pan and stir fry them. 8. Sprinkle Flour over the vegetables. Mix and cook very well until the Flour is not visible. 9. Add 1/3 of Amazu Sauce mixture into the pan. 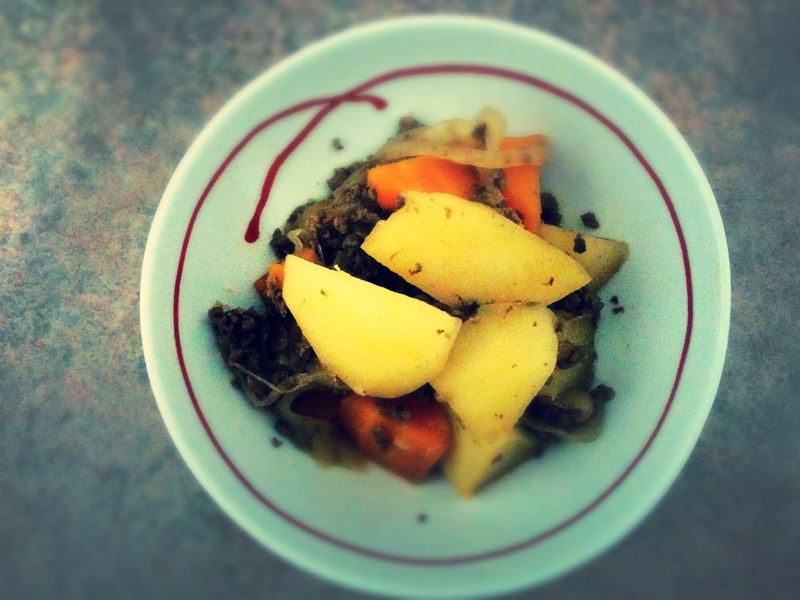 Stir it with vegetables very well. Repeat the same 2 times. Make sure that Flour is dissolved and any ramp of flour is not left in the sauce. Stir it very well very time the mixture is added to make the sauce smooth and shiny. 10. Remove the Crispy Skin from the Salmon meat. Keep the skin somewhere dry to keep the skin crispy. 11. 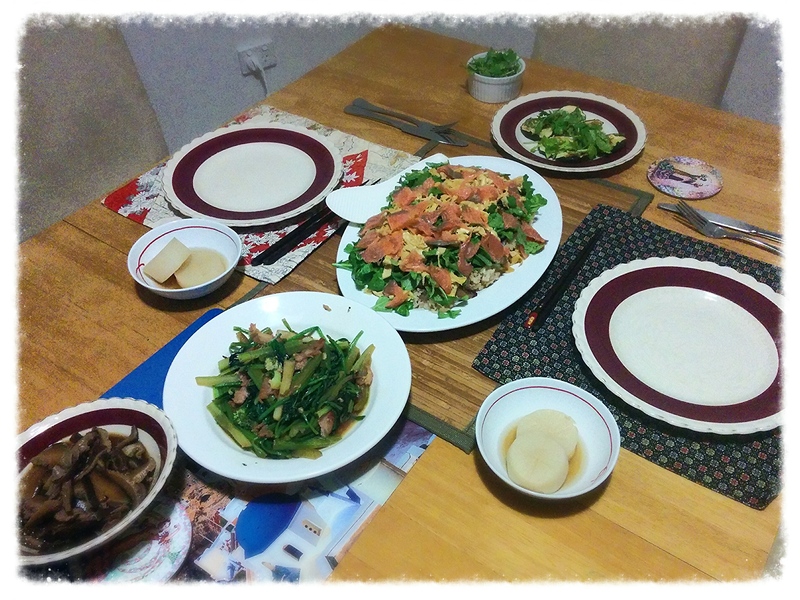 Place the Salmon meat on the serving plate. Put the Amazu Sauce over the Salmon. Put the Crispy Skin on top of it. 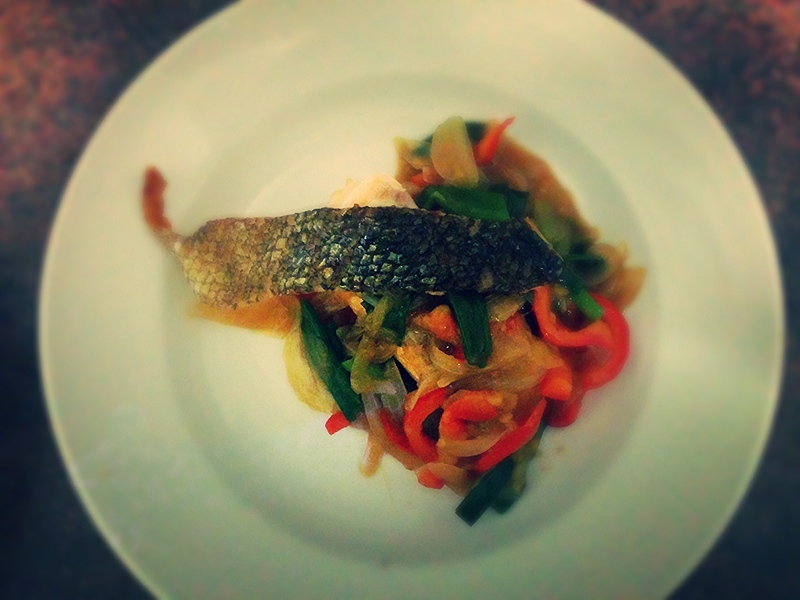 * Method 1 helps us to remove unpleasant fishy smell from fish. Water will come out for fish after letting it sit for a while which is the cause of smell. This water will be soaked in and removed by the kitchen pepper tower. Fish can keep its lovely flavour with enough saltiness. ** To make Crispy Skin Salmon, it is important not to touch. When you tough the Salmon is only once; when you turn the Salmon over.